Plans to charge Monmouthshire shopkeepers for putting their displays on the street have been dropped. The county council was to restrict "obstructions in the highway" with a permit and fees scheme amounting to about £250 a year for a shopkeeper. 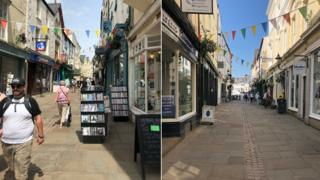 Traders responded that it would make market town streets look "closed for business". But Monmouth greengrocer Phil Munday now says "common sense has prevailed" after the council scrapped the plans. The council's cabinet met on Wednesday and approved a select committee recommendation to change the proposed policy that applies to anything from potted plants, tables and book stalls to fruit and veg displays. It covers market towns such as Monmouth, Abergavenny, Chepstow and Usk. The council's head of operations Roger Hoggins had said the intention was to provide "safe routes" for buggies, wheelchairs and people who were visually impaired. But traders complained it would impact on tourism, and more than 3,000 people signed an online petition. The permit scheme will still go ahead but the planned charges will be dropped, with a restriction of 18 sq m on the area covered also removed. Shopkeepers will still have to apply for a permit and carry out their own risk assessment. Charges will be applied only if traders fail to comply with the permit scheme. Disability campaigner Nathan Davies had described the permit plan as a "really good and fair idea". Munday and Jones greengrocers in Monmouth's Church Street was faced with paying £300 a year for its two 6ft (1.83m) tables. Phil Munday said the council's change of heart was "more than fair". "Traders have their own insurance anyway covering their displays," he said. Stephen's Bookshop also in Church Street threatened to close because of the charges as a lot of its sales come from the books displayed outside. Owner Stephen Porter said: "The high street is already crumbling because of business rates, it's a travesty."